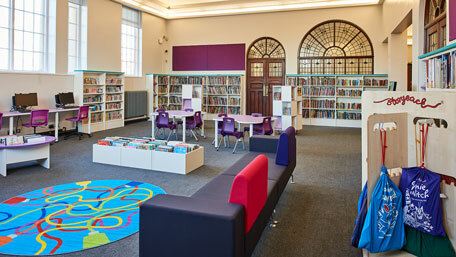 Dartford Library marks its centenary year with a £650,000 restoration celebrating its heritage and historic roots. Kent County Council agreed a refurbishment proposal for the 100 year old Carnegie building after a six-week consultation showed huge support for it to reflect the heritage and past glories of the building. Demco Interiors worked closely with the library team to design and furnish an interior that paid homage to the tradition of this lovely old building and its listed features. 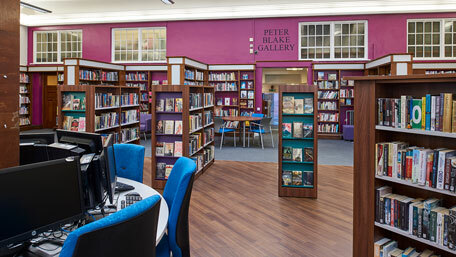 The existing listed bookshelves were refurbished, while Demco designed and manufactured new shelving, with an oak finish and grey shelves to match. Throughout, accent colours in purple and teal take influence from the beautiful existing stained glass details of the building. The children’s area features Demco’s bright and vibrant Mimi furnishings and carries on the colourways of the stained glass, translated into a bold, bright child-relevant space. The traditional theme continues with leather-look Chesterfield sofas and oak finished glass cabinets displaying archives and local history items. Care has been taken to retain the floor tiling and parquet flooring to sit alongside the Scandi look of the children’s area and the 50’s styling of the chairs.